The story of Subsurface Circular is pretty straightforward. Set in the distant future, humanity has successfully created android-like machines called Teks. Teks are manufactured for the purpose of doing jobs crucial to everyday life in society, such as childcare, construction, detective work, and even psychiatry. The player takes on the role of a detective Tek on board a subway system en-route to carry out an assignment for “management,” the human masters behind many of the Teks programming and job assignment. 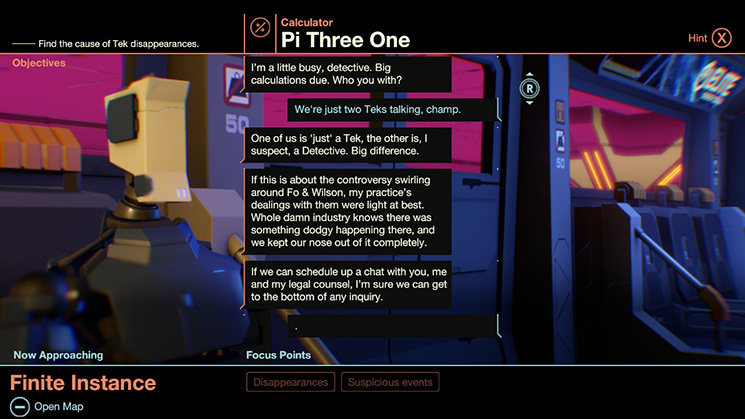 While on board, the player encounters another Tek whose friend has gone missing, and pleads with the player to take on the case. As a result, the player begins to unravel the mystery of the Tek’s disappearance as well as much bigger mysteries beginning to take shape in Tek society. While Subsurface Circular’s story is mostly linear, it remains intriguing from start to finish. Without going into too much detail, the narrative does all the things that are crucial to make a setting such as futuristic societies and the singularity engaging and believable. Over the course of the game, you’ll unravel bits and pieces of what human society has become and where Teks fit into it. Being a text-based adventure game, there is very little actual gameplay that is required of the player. The bulk of the game is focused on its narrative and puzzle-solving, both of which are delivered in interesting ways. Unlike most text-adventure games that have the player navigating scenes and collecting inventory items to use in certain situations, the player is rooted in place for the entirety of the game with new characters leaving and entering the scene each chapter. This makes sense from a narrative and gameplay standpoint, as the Tek the player is controlling is “geo-locked” to the subway by management while the surrounding Teks must arrive and depart from their respective stops as the game progresses. It also helps to cut out a lot of what makes text-adventure games a bit of a slog, as there are no unnecessary direction inputs or world navigation to slow down the pace of the narrative. Instead, the gameplay focuses around dialogue choices and puzzle-solving. Many of the puzzles presented are logic-based, requiring the player to apply problem solving to certain situations, usually with the end goal of coercing certain Teks to give up valuable information regarding the ongoing mystery. Thankfully, there is a helpful and unobtrusive hint system that’s easily accessible anytime you’re feeling stuck on a certain puzzle or situation. While the puzzles aren’t anything too overly complicated, they do a good job of making the player think about how best to approach certain characters and situations, as well as just testing your problem-solving abilities. 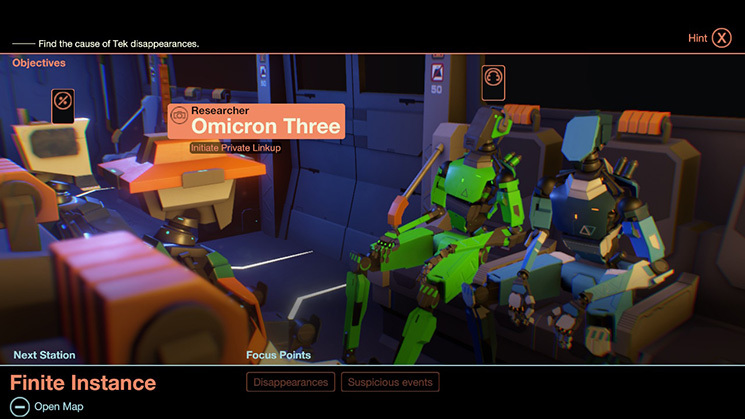 In addition, Subsurface Circular utilizes what are called Focus Points, in place of traditional inventory items of more traditional text-based games. Focus Points are very similar to additional dialogue options, and are obtained by talking to characters and having them reveal crucial information to the case at hand. Once a Focus Point is gathered, you can bring them up with other characters in the scene, whether it be to gain additional information or to solve puzzles to progress the narrative. The Focus Point system works well in Subsurface, as it once again helps the narrative pacing and feels very natural in a game that focuses so heavily on its storytelling. Interestingly, while Subsurface Circular falls into the text-based genre, there is a great amount of detail and effort that is prominent in the game’s presentation, both in its art style and UI design. While there isn’t a ton of flashy animations or action sequences, each scene is set up and with unique camera angles and lighting. Additionally, each Tek that enters a given scene has a unique design and color, which helps to keep the stiff, robotic characteristics of the Teks a certain sense of personality. The graphics and designs of the Teks and their surrounding environments are extremely well done, and look sleek and futuristic on the both the Switch’s handheld and docked mode. The UI design meshes well with the game’s aesthetic and concept, being futuristic and straightforward. The game’s soundtrack is engaging as well, as each chapter has different music tracks and ambient sounds to accompany the scene. The tracks consist of electronic beats and rhythms that play ambiently in the background, as each track is actually played by a Tek that is a part of the scene. It’s little details such as these that really help to build the world that Subsurface Circular takes place in. 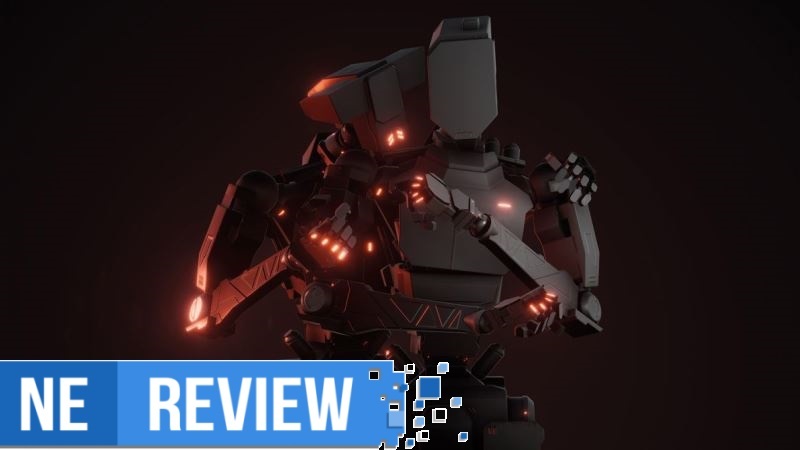 While Subsurface Circular is a fairly short game which can be played in one-to-two sittings, there is a bit of extra content that extends the life of the title. Upon completing your first playthrough a handful of extras are unlocked, such as a concept art gallery and a full-on developer commentary. The developer commentary is a great feature, as it allows players to explore a second playthrough while getting an unobtrusive behind the scenes look at the entirety of Subsurface Circular, like art style, music, narrative choices, and theming. Additionally, you can access a chapter select screen, which allows the player to start from select chapters to explore different dialogue paths instead of replaying the entire story from the start. Subsurface Circular is an interesting little indie game that fits great on the Switch. For an asking price of $5.99, the short playtime and intriguing narrative makes Subsurface Circular an enticing package. While not the most gameplay-intensive experience you’ll find on the Switch marketplace, the themes and issues that are explored throughout Subsurface’s narrative make up for the lack of action. Subsurface Circular is a unique take on the tried and true text-adventure genre, and manages to create a fully-developed and thought-provoking narrative that’s easy to experience and well worth the time to put in. Subsurface Circular review copy provided by Bithell Games for the purposes of this review.